Eggs are a great way to start off the day right. Savory and full of protein to keep you full and energized. My family eats breakfast for dinner usually once a week too. Everyone love brinner. 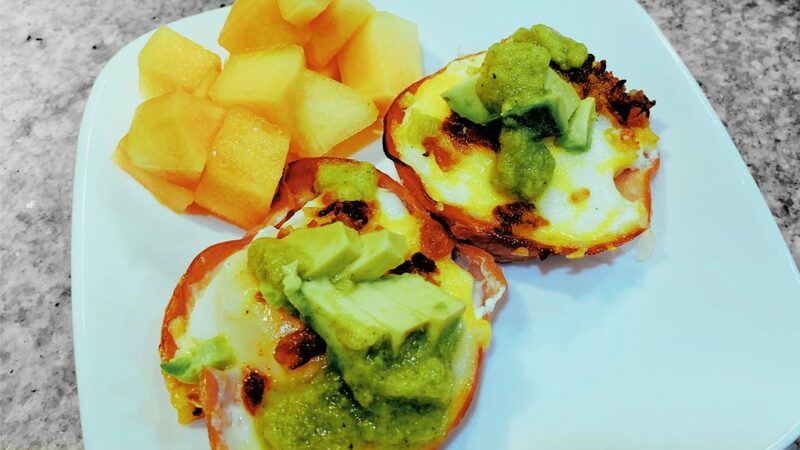 Egg Cups with Ham are a fun alternative to scrambles and frittatas. 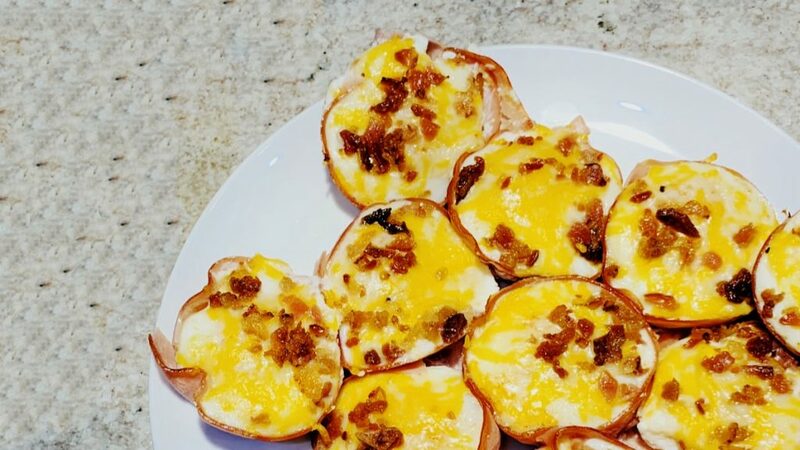 In this recipe, the eggs are topped with bacon and cheese, but the possibilities are endless. You could top them with whatever you want. 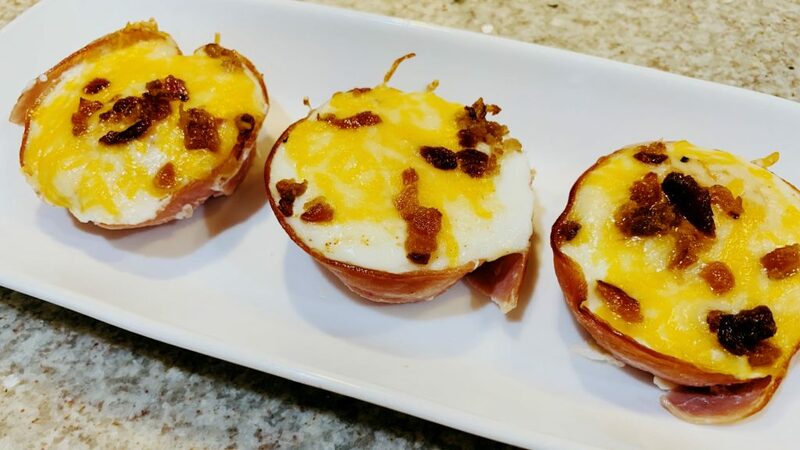 Eggs Cups with Ham are very versatile. The individual portions are perfect for a brunch potluck, Easter or Mother’s Day perhaps. They are also great for making ahead and eating on the go. 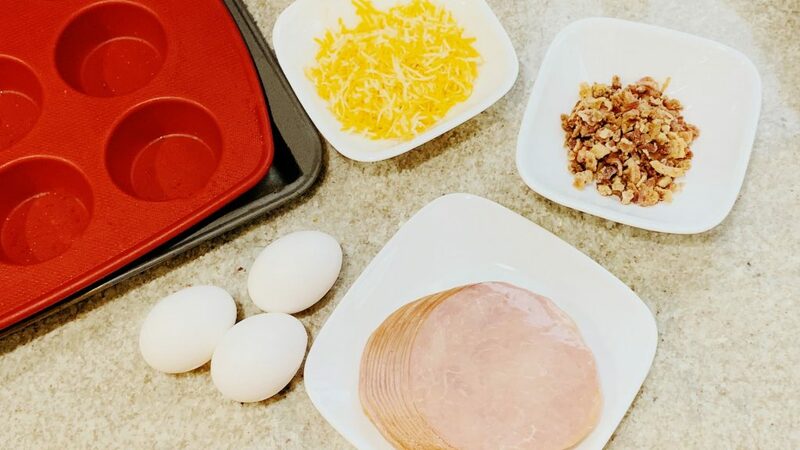 Store the ham and eggs cups in the refrigerator for up to a week, or they freeze well too if you’re really making them ahead of time. Reheat in the oven, toaster oven, or microwave for a quick breakfast. 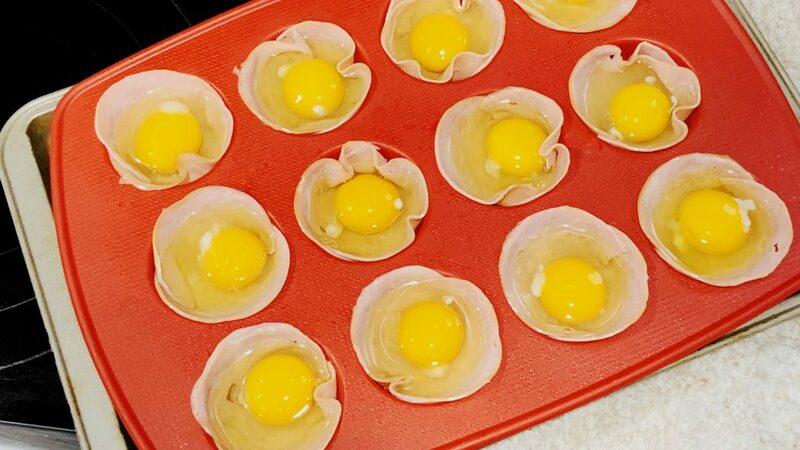 To make the egg cups, begin by lining 12 wells of a cupcake pan with sliced deli ham. I recommend spraying the wells with non-stick spray first, so it’s easier to get the egg cups out later. To get the ham to line the edges of the well, snip the edges with kitchen scissors and overlap the cut pieces. Form the ham to the edges of the cupcake well as best as you can. Fill each ham liner with 1 egg, and season the eggs with salt and pepper to taste. Bake the ham egg cups for 15 minutes at 350 degrees. Then, after the egg cups have baked for 15 minutes, take them out of the oven. 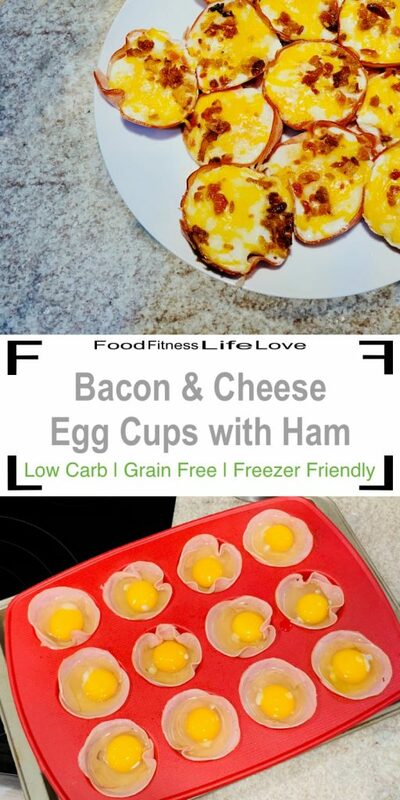 Top each egg cup with cheese and bacon crumbles. Return the egg cups to the oven for another 5-7 minutes until the cheese is melted and the eggs are set. To remove the egg cups from the pan, first slide a butter knife between the pan and the ham liner. Then, slide the knife under to pop the egg cup out. If you use a silicone baking pan, just push up from the bottom to pop them out. Serve immediately or let them cool before refrigerating or freezing. You can also add other toppings to you Egg Cups with Ham. In this case, we added sliced avocado and salsa verde. Pico de Gallo, traditional salsa and hot sauce are good too. Pre-heat oven to 350 degrees. Spray all the wells of a muffin tin with non-stick spray. Place one slice of ham into each well, press down and snip the ham as necessary to line the sides of the well with ham. 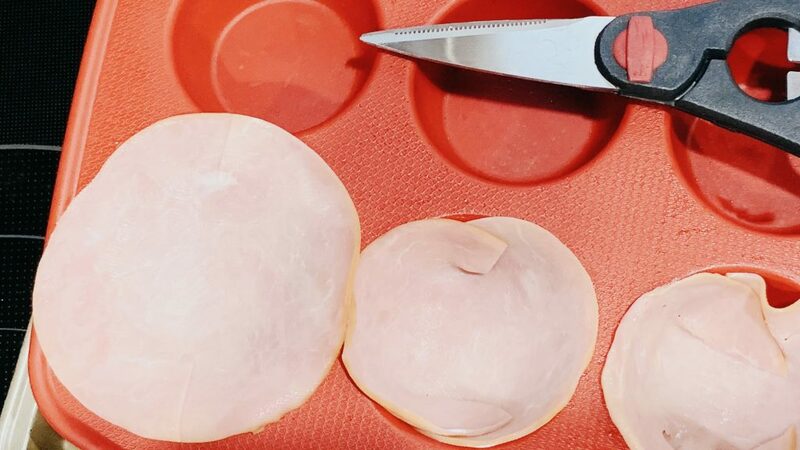 Crack one egg into to each ham liner. Season with salt and pepper to taste. Bake for 15 minutes. 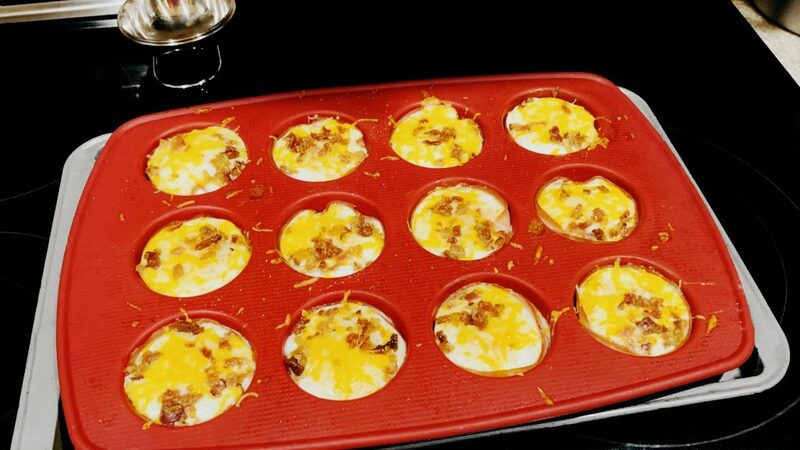 Top each egg cup with shredded cheese and bacon crumbles. Bake for another 5-7 minutes until cheese is melted and eggs are set. Remove the egg cups from the oven. Run a butter knife around the edge each muffin well, and slide the knife under the ham to pop out the egg cups. Top your egg cups with your favorite toppings and enjoy. Or cool to room temp and store in fridge or freezer for later.